Draw, Paint, Make, and Get Creative with 53 Amazing Projects! Storey Publishing, LLC, 9781635861181, 176pp. 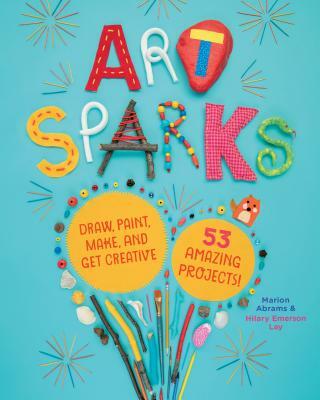 Kids love arts and crafts and every kid can be an artist with this book as their guide. Working with basic art supplies — from paint, markers, paper, and glue to household finds like cardboard boxes and fabric scraps — children learn that as long as they can imagine it, they can create it! This rich collection of 53 inspiring art projects for kids aged 6 and up is curated by two art educators with decades of experience, and offers up a ton of freeform fun. From Doodlemonsters and Painted Animal Rocks to Paper Bead Jewelry and Nature Weaving, projects vary in difficulty to engage a wide range of ages and abilities, and many can be made in under an hour. Every project featured in the book has been kid-made (and kid-approved! ), and photos of the finished pieces serve as inspiration for kids everywhere to use art to express their imagination, humor, creativity, and individuality. Marion Abrams founded the Summer Art Barn in Hatfield, Massachusetts, in 1989. She has a BFA in art education from the University of Massachusetts – Amherst and has taught art in a variety of public and private schools for over 45 years. Abrams teaches art workshops at local libraries and schools, and volunteers at senior centers and the local food bank. Learn more about her and the Summer Art Barn at www.summerartbarn.com. Hilary Emerson Lay has a BFA from Emerson College in writing, literature, and publishing, with a concentration in children’s writing and illustration. Lay managed The Spirit of ’76 Bookstore in Marblehead, Massachusetts for ten years. She is a working artist, the founder of Bubo Arts Collective, and the assistant director of the Summer Art Barn. Her artwork can be found online at www.hilaryemersonlay.com.